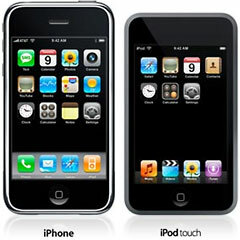 Apple never had the capacity to be a large-scale distributor of games until the iPhone and iPod touch were released followed by the launch of the App Store in July 2008.
the iPod touch by the green phone icon. There were games available initially through the iTunes Store starting in 2006 that will play on the following "regular" iPods (below from left to right): iPod classic, iPod 5th generation, and iPod nano 3rd, 4th, and 5th generation. 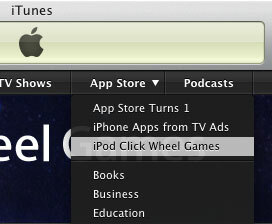 These "click wheel" games will not play on the iPod touch or iPhone, which run games from the App Store. Click wheel games are still available from the iTunes Store: If you're using iTunes 9, select the App Store, and then select iPod Click Wheel Games from the pulldown menu. If you're using iTunes 8, there's an iPod Games link on the main iTunes Store page. With the release of the iPhone and iPod touch apps, Apple is poised to become a major player - and possibly the largest distributor in the video game industry. As Steve Jobs indicated in his latest "Stevenote" presentation, there are now over 100 million iTunes Store accounts with credit cards, making the iTunes Store one of the largest online marketplaces in the world. With the App Store continuing to grow, along with the availability of games (6,000+ games now available), there is incredible potential for Apple to capitalize on a market that has been traditionally held firmly by the likes of Sony, Nintendo, and, more recently, Microsoft. The biggest problem with App Store games is that Apple and the software developers have made these applications playable only on the iPod touch and iPhone. These games will not play on your Mac, because they are designed to work only on iPhone and iPod touch hardware. Nintendo (the big "N", as we know them in the gaming industry) has consistently released family friendly content and is very proud of its Virtual Console and original Wii Ware titles, which are digitally distributed and stored on the Wii or an SD Card. 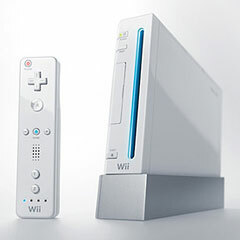 Nintendo Wii (Fall 2006) offers many classics and new content through Virtual Console and WiiWare downloads. Unfortunately, these products can't simply be played on a Nintendo DS. The same holds true with Nintendo's newest product, the DSi, which has a separate download store. The Nintendo DSi, released in 2008, has it's own digital content store. Why couldn't the DSi utilize all Virtual Console games from the Wii, giving you the freedom to use them where you want? The DSi could have simply delivered digital versions of the Game Boy, Game Boy Color, and Game Boy Advance library, along with new content on DSiWare. Microsoft failed to cross-market the Zune with the Xbox 360, and they still haven't figured it out. Had they done so, their audience for the Zune could have included millions of Xbox 360 owners. Instead, Microsoft continues to insist on another failed attempt to create a media player to rival the iPod (specifically the iPod touch). I could go on and on why the iPod touch is a better device, but just two words sum it up: App Store. The Zune missed the boat again - It could have been designed to compete with the PSP and should have been the media player it is with support for Xbox Live accounts and Xbox Live Arcade games. The Zune could have been a gamer's dream and could have helped push the Xbox 360 to new heights had it included this feature. Sony is the only player in the gaming industry that has gotten it right. Although the Xbox Live Arcade is superior from an offering of games thus far, there is no handheld marketed with the Xbox 360 to take advantage of this feature, compared to how the PS3 and PSP go hand in hand. Sony is quickly catching up to Microsoft with the PlayStation Store, which was initially designed to deliver digital content to the PS3. When Sony added support for the PSP, it took things to a whole new level. Now nearly all content from the PlayStation Store (except specific PS3 or PSP content) can cross back and forth between both platforms, giving you the flexibility to watch a movie or play certain games at home or on the go, provided that you own both devices. If you own a PSP-2000 or later, you can even download a PS1 classic, a PSP title, various movies, or music, and play them back directly on your TV or home theater system with component/composite video and stereo sound cables without the need of the PS3. With the recent price drop of the PS3 to $299, all competitors should be watching closely. Sony may be the big winner this holiday season. I bet Apple and the developers who sell games on the App Store would like to increase volume, and I'm sure that Apple would also like to compete full force against the biggest players in the gaming industry. Why not engineer a new technology centered around iTunes 9 that would allow for cross-platform use of App Store content (especially games) on any system that supports iTunes 9? All that needs to happen is for the geniuses at Cupertino to design an Apple gaming controller that makes you say wow and sell a special Bluetooth USB adapter (for use with systems that don't have built-in Bluetooth). Then they would just need to include some sort of virtualization/emulation of the iPhone/iPod touch hardware within iTunes 9 that would allow games (and possibly other Apps) to be utilized by any system that supports iTunes 9. Add an Apple TV (Apple just slashed the price for the 160 GB version) or a supported Mac (or PC, I suppose), and you could play App Store games anywhere, anytime. The beauty of Apple TV is that the outputs are already there to connect to most TVs and home theater setups. It could really double as a gaming rig (along with any other Mac - especially a Mac mini) if equipped to do so, allowing you to shift your entertainment on the small screen of the iPod to a larger screen. The 2009 Mac mini has plenty of options to output video and sound, and it's compact. Apple TV is also compact and designed specifically as a media hub. What Challenges Must Be Overcome? App Store content is designed with a small, low resolution screen in mind, and games designed for the smaller resolutions of the iPhone and iPod touch may not look as good on a larger screen. App Store content exists to help sell iPhones and iPods. Keeping this content exclusive to iPhones and iPods entices potential buyers of that hardware. Apple may not be willing to invest the time and effort to create the necessary virtualization software that will allow App Store content to run on a Mac at full speed. App Store content could play in a "windowed" mode using virtualization or emulation software that would increase the resolution to play on a TV or monitor, but it would limit the maximum resolution to a preset amount in order to not make the images degrade poorly. The PSP is successful at doing this with games that are output to a TV (they play in a "windowed" mode). Movies output with a Component Video cable play in full screen on a TV from the PSP (PSP-2000 and later). The MPEG-4 compression used on UMD Videos and PlayStation Store downloaded content allows for DVD quality images on small or large screen resolutions while retaining a small file size. This could actually help iPod and iPhone sales, because if you could try these games out at home, maybe you would like them enough to have them on the go as well. Apple should invest the time and effort in order to ultimately increase sales of Macs, iPhone/iPod touch, and App Store downloads. Dan Bashur lives in central Ohio with his wife and children. He uses various PowerPC G3 and G4 Macs running Tiger and Leopard. Besides finding new uses for Macs and other tech, Dan enjoys writing (fantasy novel series in the works), is an avid gamer, and a member of Sony's Gamer Advisor Panel. You can read more of Dan Bashur's work on ProjectGamers.com, where he contributes regular articles about the PSP, classic gaming, and ways you can use Sony gaming hardware with your Mac.